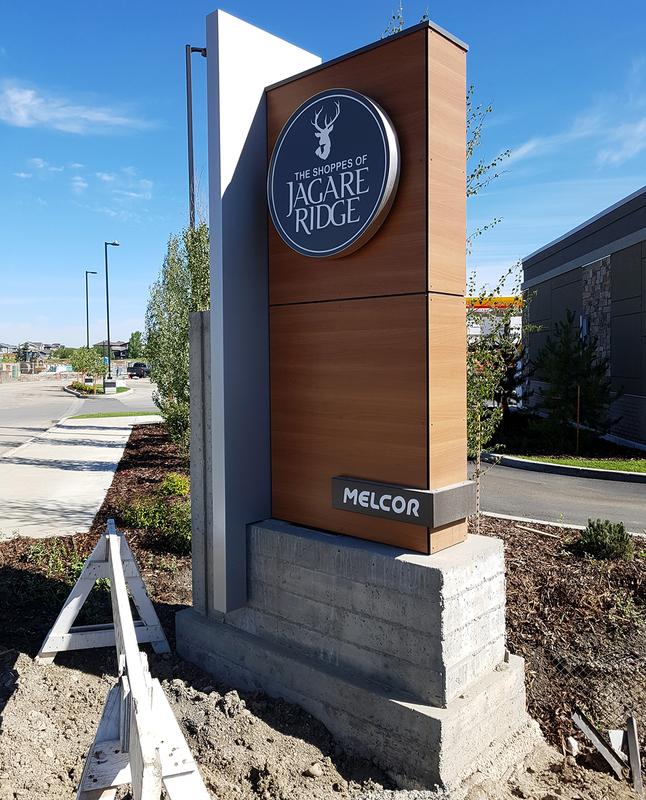 Freestanding Pylon signage is a must-have for any shopping centre, strip-mall or commercial development; Landlords generate revenue by renting panels to their tenants, and tenants easily attract customers to their business from the street. However, in a lot of cases as a development grows, so does the pylon signage. New panels are added, existing panels revised, and the display becomes too visually busy to be effective. 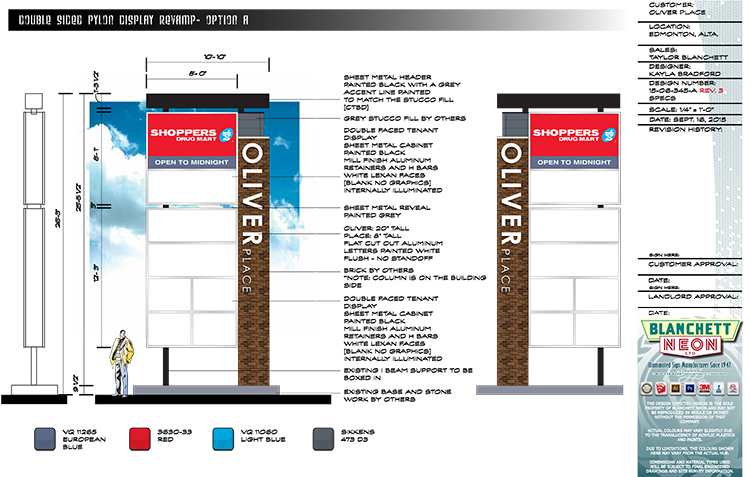 Such was the case for Oliver Place in downtown Edmonton. We manufactured the original Oliver Place pylon structure back in 1991, and earlier this year when the property underwent a facade improvement, we were approached to assist with the freestanding pylon upgrade. Has anything changed in the City’s bylaws or area plans that might effect or limit our design capabilities? Checking the zoning for a specific area is always our first step in the design process. Learn more about Signage Permitting. Do you have any anchor tenants that require top or large panels? Have the number of tenants increased or decreased? Do you expect the number of tenants to change in the future? If the property is undergoing an upgrade or change, should the new pylon sign compliment the building? Should the name of the property be featured on the display? It will reduce the available space for tenant panels, but might be a landmark visitors are looking for. 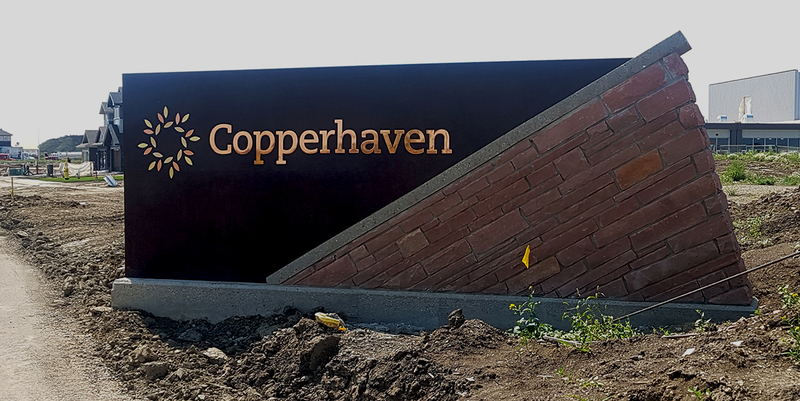 With these questions answered, our talented design department created the above pylon design that complied with local permit requirements, complimented the building, and featured the name of the display for reference. 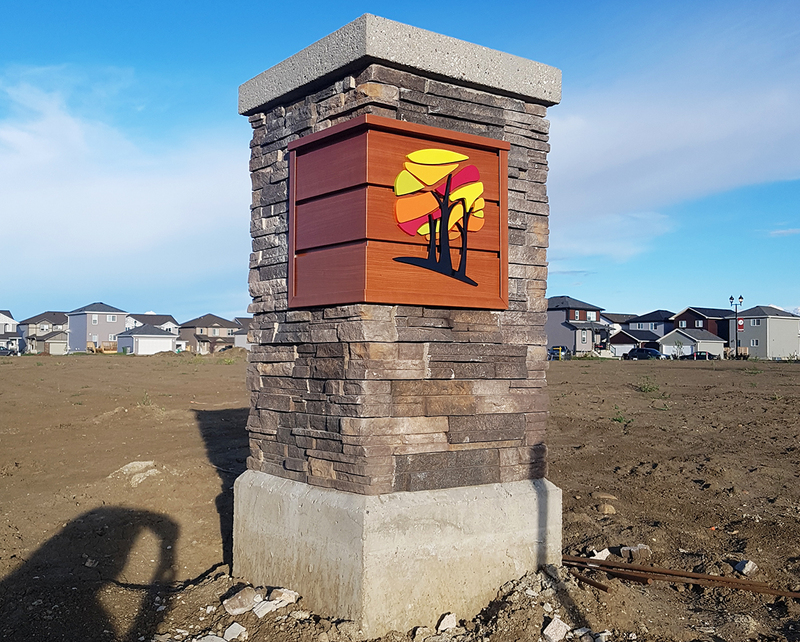 To help keep the project on budget, we reused the internal structure (steel support poles, concrete bases and anchor bolts,) and only manufactured a new tenant cabinet, header structure, non-illuminated individual letters, and pole cladding to be installed on the refurbished poles. As part of our comprehensive project management services, in addition to achieving the signage permits, removing the existing display and manufacturing the new, we also supplied graphics to a number of the tenants. For more information on upgrading existing pylon displays, please Contact Us. The newest addition to the Edmonton Downtown Neon Museum may bee one of the sweetest! (Pun intended). 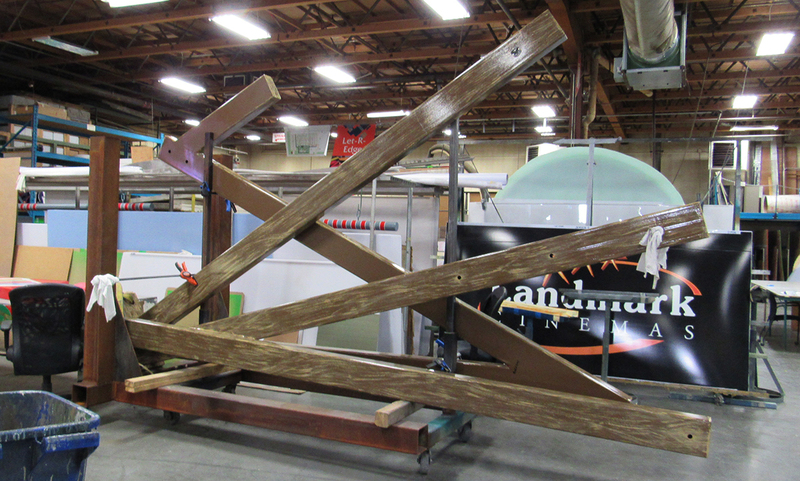 Following our previously completed sign restorations for Canadian Furniture, Northern Alberta Railway, and Canadian National Railway, we were very excited when the opportunity came to restore the classic display for Bee-Bell Health Bakery. Check out our previous post for more information and photos on the first round of Sign Restorations. The Bee-Bell Sign was previously brought into our shop in 2011 for a full restoration process, so when the owners donated the sign to be installed at the Edmonton Neon Museum, only minor paint and final finishes touch-ups were required. Every signage display that goes through our shop (either as a sign restoration or a brand new display) is tested in the wiring phase of production to ensure all components are in perfect working condition prior to leaving for installation. In the previous restoration process, we replaced approximately 10 units of custom neon tubing, so these replacement parts were re-tested, and the sign was (unsurprisingly), working as well 5 years later as the day it was re-installed in 2011. The next step in the process was to re-install the completed, and fully functioning sign at the Edmonton Sign Museum at the Downtown Edmonton location on the side of the Telus Building on the corner of 104th Street and 104 Avenue. It was our absolute pleasure to have the opportunity to complete even the smallest sign restoration details on this playful, classic neon display, and we are looking forward to the next sign restoration opportunity to add to the Edmonton Downtown Neon Museum! Established in 1947, Blanchett Neon Ltd is one of Edmonton’s most diverse and innovative custom signage manufacturers. 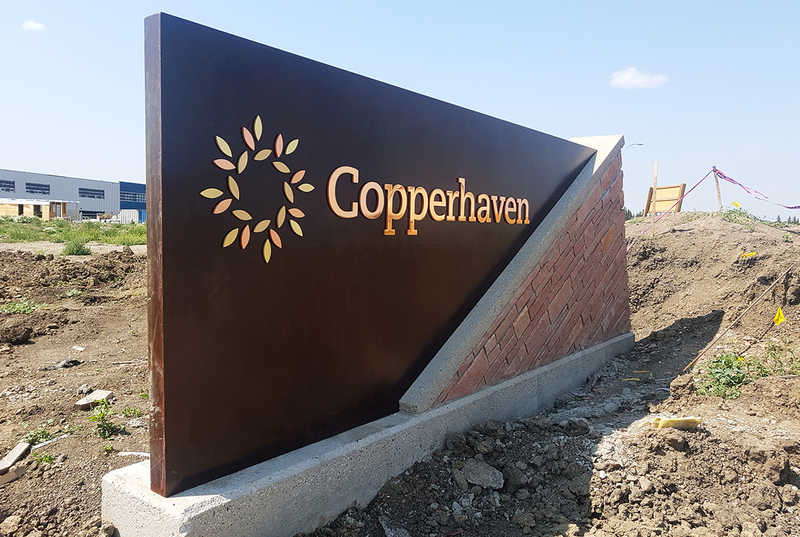 Our services include comprehensive signage design through our award-winning design department, CSA approved manufacturing by trained and certified professionals, safe installations, and service & maintenance all based out of our 28,000 square foot Edmonton facility. We are very excited to announce our ongoing partnership with the Edmonton Public School Board through our recent awarding of two (2) new school sign projects: an Interior Directory wayfinding sign program for J. Percy Page school, and the supplier for exterior electronic signs for the school board. The wayfinding program for J. Percy Page consists of removing the existing wayfinding displays, and designing, manufacturing and installing seven new signs throughout the school. Designed by our senior graphic artist, Jeff Billey, the displays consists of a brushed aluminum panel featuring the school’s unique branding and logos behind an illuminated section that assists with directing students and visitors throughout the school. We brought our extensive experience working in active school environments to the design process, and incorporated rounded corners to the illuminated directory panels and internally contained all electrical elements to reduce chance of injury. After previously being awarded the contract to supply electronic message centre displays for the Edmonton School Board back in 2013, (and installing displays for two Edmonton Schools,) we felt confident in putting our best foot forward for this latest contract. The proposal required the sign design to be flexible enough to conform to the unique site conditions found at each school, while maintaining distinct branding for the Edmonton Public School board. Our winning display design is flexible in both overall size and height to suit each individual school’s needs, while the electronic portion (electronic message centre or LED sign), is programmed remotely inside the school building for safety purposes. As with the J. Percy Page proposal, our familiarity with school signage played a hand in the design process, and we chose screw piles in place of traditional concrete bases to eliminate the possibility of the base becoming a tripping hazard for kids playing near the sign. 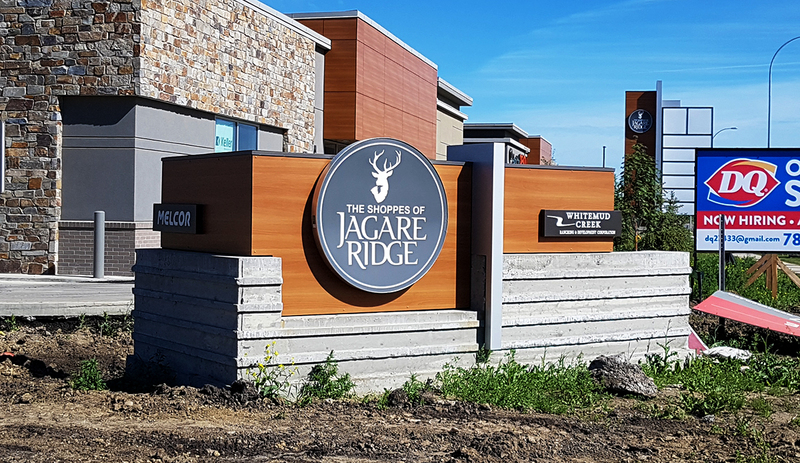 We are proud to continue our rich history of successfully completing signage projects for educational institutions, schools, and school boards across Western Canada, and are excited to see the finished displays installed! Looking for inspiration for your own School Signage project? Our Portfolio features a comprehensive collection of previously completed signage displays or Contact Us for more information! 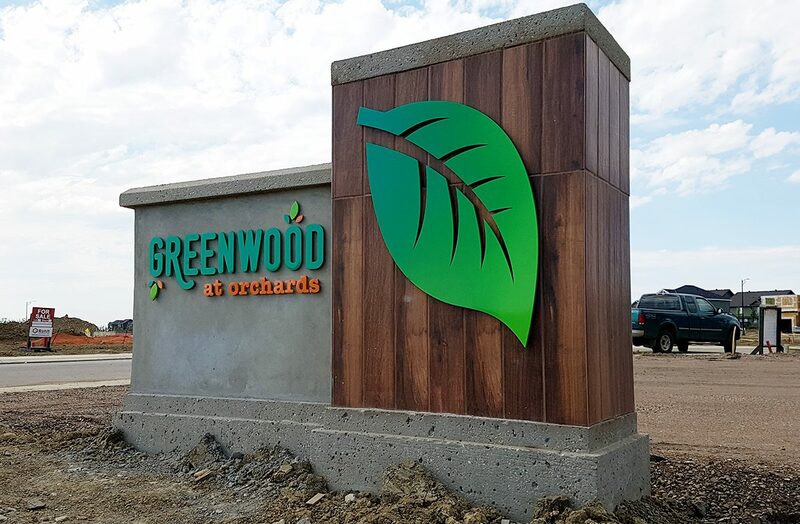 We are privileged to have worked with Mill Woods Assembly recently on a new LED sign for their prominent Mill Woods location. The church was looking for signage that would reflect their updated, more modern brand image, and a digital display was the perfect solution to communicate to the community everything they do. Design a concept that would complement the existing building and reflect the new image brand image for the church. Work within a specific budget. Balance the permit concerns that the City and nearby neighbors had regarding the impact of an electronic sign in the community. Compliment the simple square black architectural lines the large feature window had in the pylon design. A single-sided display allowed the church to afford a higher-resolution display that fit their vision for an electronic sign. Going with a entire new pylon instead of revamping the existing allowed us to place in a more ideal location. In the end the church purchased a simple pylon structure that complimented their existing building with a Daktronics GP4 110×220 16mm digital display that clearly communicates their message while reflecting the new modern brand image. The completed sign could not have turned out better! Curious if an Electronic Message Centre is the right fit for your church or house of worship? Contact Us today! 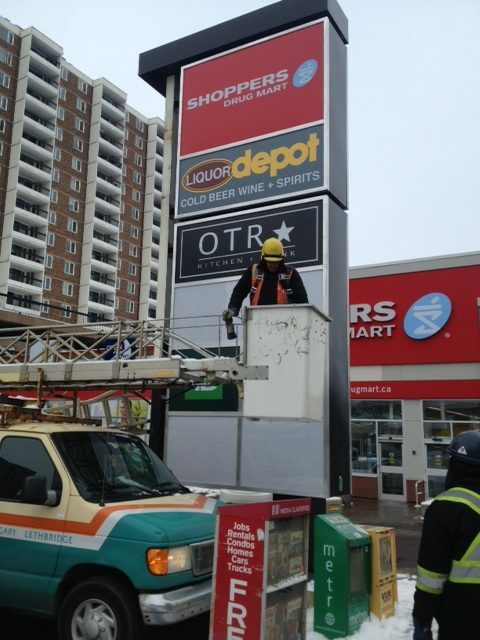 Although Edmonton has one of the most progressive digital signage bylaws in North America, there are still a few locations throughout the City that require careful consideration from Planning & Development officials prior to approving the LED sign permit. Such was the case with our friends Norquest College at their downtown Edmonton location. We have assisted Norquest College with comprehensive signage services for their locations across the province for many years when we were approached to help them replace their existing readograph (changeable letter) displays. Their desire was to upgrade displays on their main campus building, as well as a freestanding pylons sign to modern electronic signage to better advertise and communicate the educational services they can offer to to a broader range of students, and to celebrate academic excellence and achievements. Once we had decided on a design concept, the Edmonton sign permit application was made, and we began consultation with the city immediately. Not only was the zoning complex, but their location also fell within several downtown overlays (Edmonton Downtown Plan, Neighbourhood plans, ext.) which would affect every aspect of the project. The first major concern came from the department of Transportation; they were concerned about safety for both drivers and pedestrians in the busy downtown location. After numerous meetings with city officials, we negotiated a solution that worked for Norquest’s advertising needs, as well as satisfied Transportation that the displays were safe by implementing 30-second hold times on messages. The City then determined that we needed Edmonton Design Committee (EDC) approval. The Edmonton Design Committee review permit applications in recognized regions of Edmonton to maintain a “high-level of Urban Design” (1), and will either approve or decline the permit application; there is no opportunity to appeal their decisions. Our presentation was complex (over 20 pages long), and took several weeks to prepare. On behalf of Norquest College, we pitched our presentation to the EDC, and answered questions to ultimately get their conditional approval. Our approach to solving complex permit applications is working towards finding a balanced solution that works for the business we are representing as well as the individuals employed by the city to enforce the process. 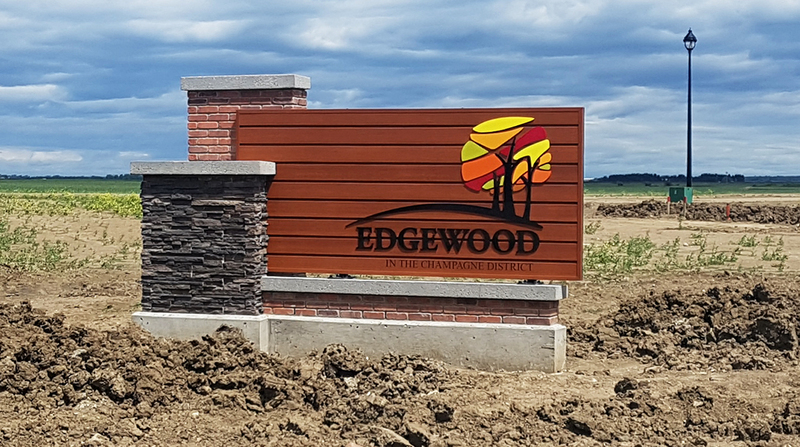 By offering collaboration and cooperation with the various governing bodies, we were able to work with the city to have the Edmonton sign permit approved. After working with the DOW Centennial Centre in Fort Saskatchewan back in 2005 to design, manufacture and install their signage displays, we were very excited to get the opportunity to work with them again for their new digital signage display when the tender was released. Our experience with Daktronics and their products, as well as our reputation and digital signage expertise led to our being awarded the project. The DOW Centennial Centre’s new display is a 16′ x 16′ square display with 20mm pixel spacing, and is one of the largest on-premise Daktronics displays in Canada, and the second largest Daktronics display in Western Canada. This oversized display was installed November 2014, on schedule, and we couldn’t be happier with the final result. For more information on how electronic signage is the most cost effective form of advertising, check out our Digital Signage page. In early 2013, Blanchett Neon was proud to have been awarded the contract from ATB Financial to manufacture and install 3 sets of 12′ High letters for their newly minted downtown Edmonton Headquarters, as well as install YESCO Electronics vertical and horizontal RGB strip lighting outlining the corners of the building (among other signage). This was a huge project for us, not only manufacturing from scratch the 12′ high letters, but also installing these letters 26 stories in the air via a swing-stage. The building looks great, and our friends at ATB have been busy using their building’s unique lighting elements to illuminate and complement our downtown core in a variety of ways- the YESCO Electronics LED mini pucks in the letters allow a fully programmable range of motion within the letters. In the photo above, ATB used the vertical RGB strips on the side of the building as a metal-count for the 2014 Winter Olympics. With this installation, Blanchett Neon has successfully manufactured and installed Skyline signage for 2 buildings in the last year- downtown Edmonton is becoming a great portfolio of our quality Skyline Signage displays! For information on the JACOBS Engineering building, click here.